It was our four year wedding anniversary last week. Normally we head away for a night and meal somewhere but as we have some time off booked in October, so we headed into town for dinner and drinks. We had a few options as there have been a few new places that have opened recently. We weren’t in the mood for thai or bistro dining, so we chose to try out Scotch & Rye – a new American style bar and kitchen. Our most recent experience of American diner food was at Eds‘s a couple of months back, which was ok, and a little overpriced for our liking (although the milkshakes are incredible!). The decor of Scotch & Rye is done really well – stripped back walls, with interesting vintage and quirky signs, and there’s a mix of high diner tables along with long communal tables and tables for smaller groups. The drinks menu is really impressive and I had a tough time deciding between cocktails and the various G&T combinations! I had a Gin Mare Tonic which was garnished with Fever Tree Tonic, Mango and Black Pepper. It was so tasty and a combination I had never thought of before, just a hint of sweetness from the mango and a savoury finish from the black pepper! Mr B tried a Franciscan IPA and declared himself a big fan. There was a big selection of obscure beers/ales on tap. Food wise, again we were spoilt for choice! There was a range of appetizers, salads, pizzas, burgers, sides and “two-handers” which were various types of hot dogs. We had saved ourselves for a good meal all day, so both had starters and mains. Mr B chose Nachos topped with chicken and I chose a Quesadilla filled with pulled pork and swiss cheese. 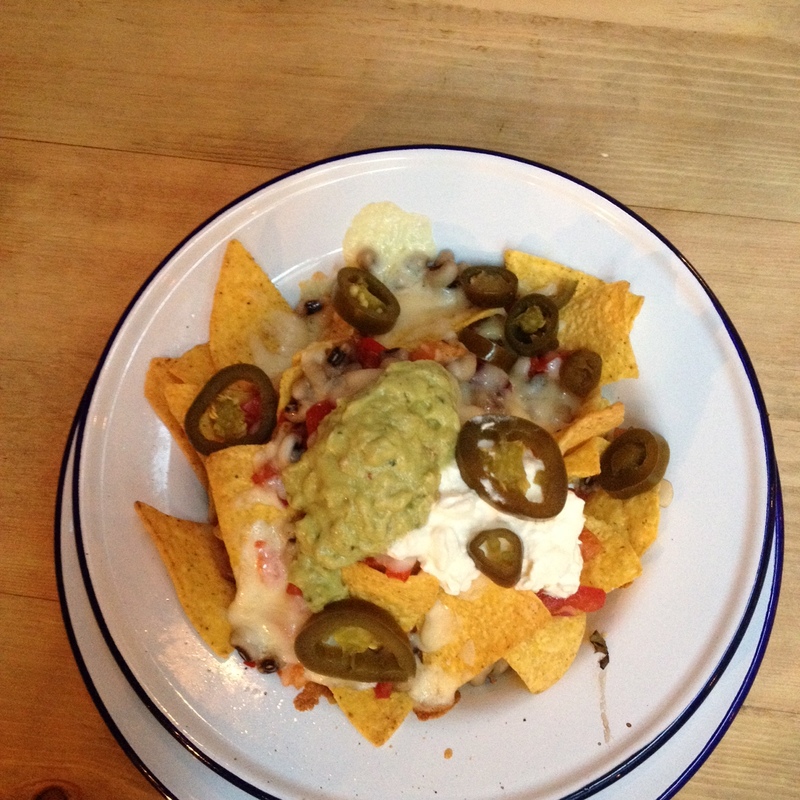 They were both good, though the nachos got sent back as there was no chicken on these, however they were quickly returned. 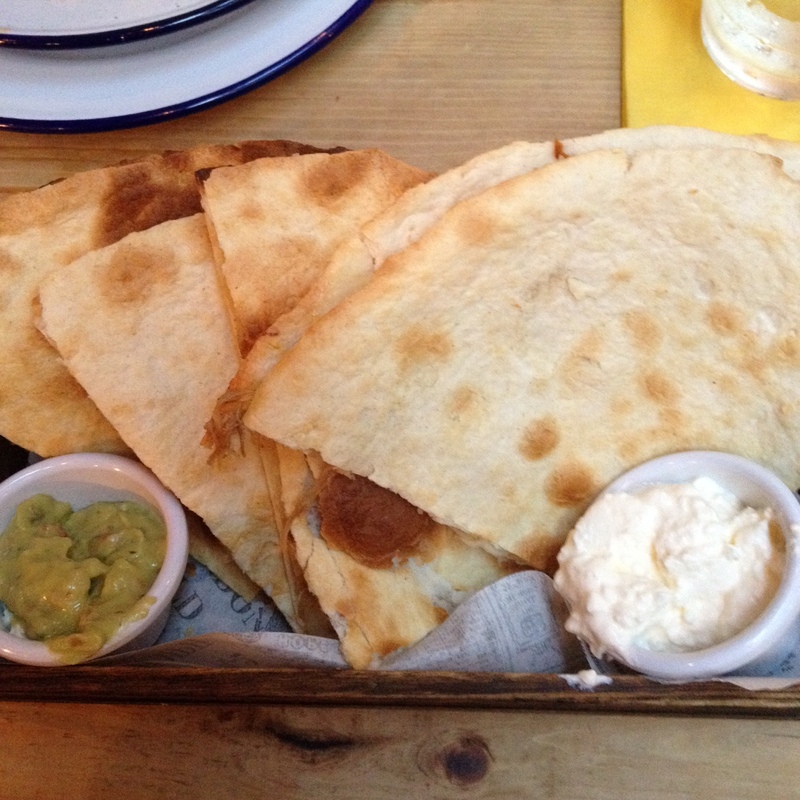 My huge quesadilla wasn’t filled with pork and cheese but definitely a decent amount enough for a starter, but was hot and tasty. 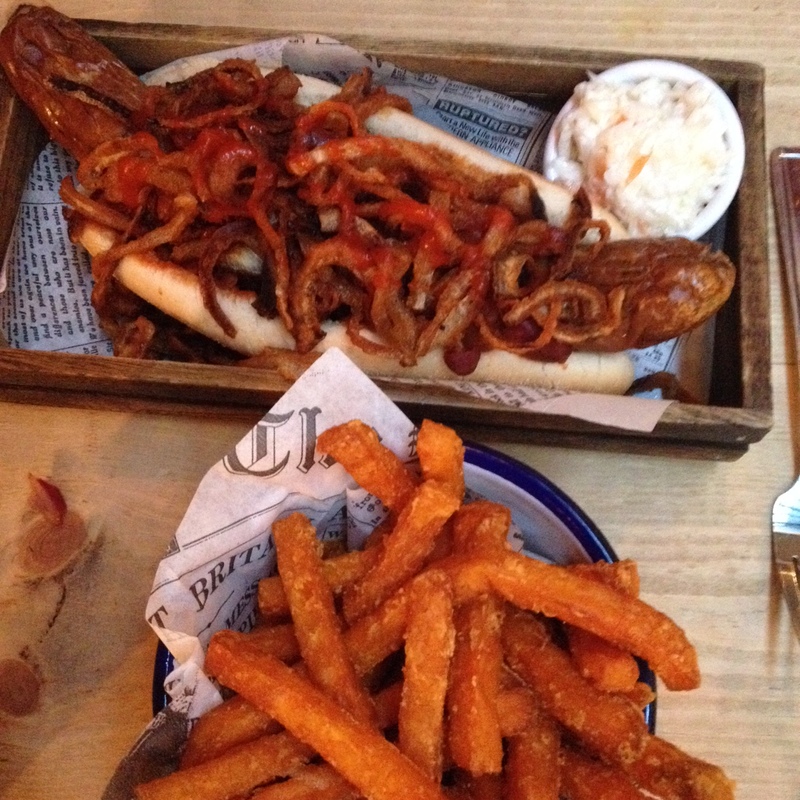 To follow, Mr B had a chilli dawg topped with tobacco onions, with sweet potato fries, and I chose the Scotch and Rye signature burger which came with shoestring fries and slaw. We both were beaten by our respective dishes despite our best efforts. 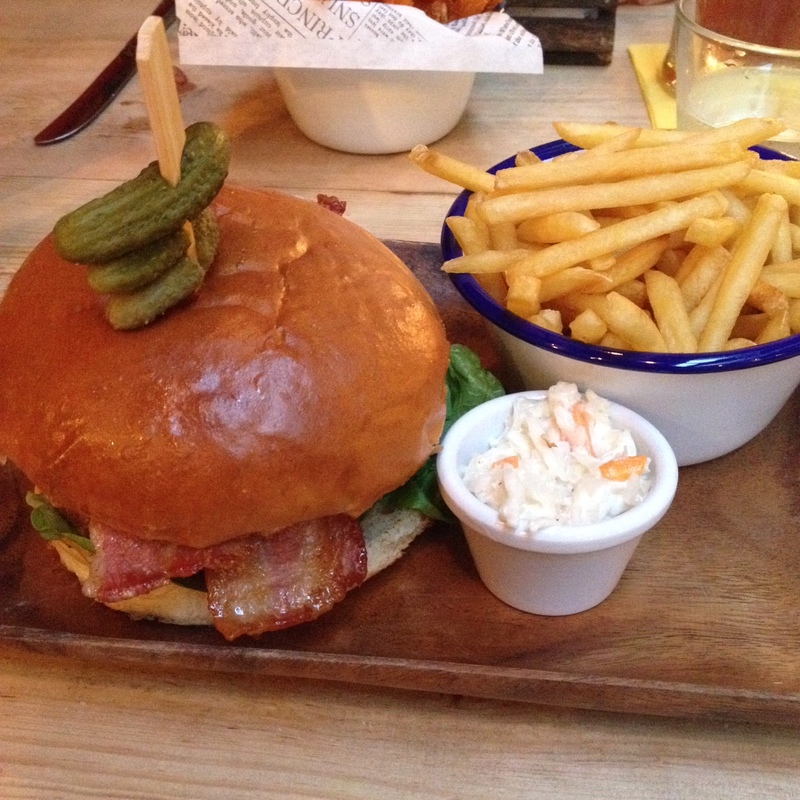 My burger was exceptional and was not fatty or greasy in the slightest – they must have used some top quality meat as it really was excellent, the bun was so soft but I decided to leave some of that with the fries as it was just so big! Mr B was loving his chilli dawg with the heat of some siracha sauce. We skipped dessert as a – we were too full, and b – most of the desserts included nuts (of which Mr B can’t partake). 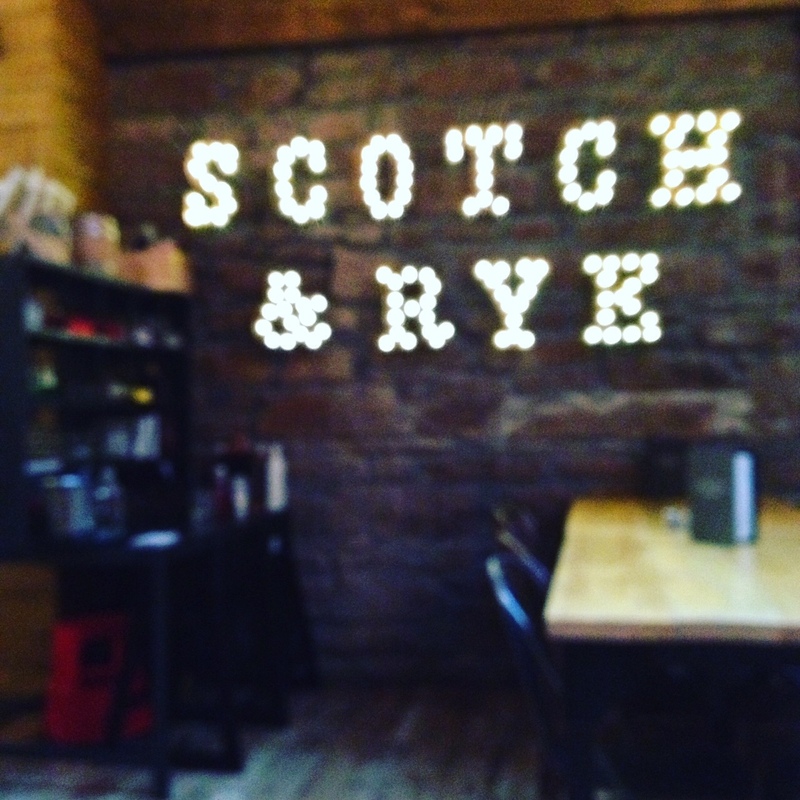 We loved our meal at Scotch & Rye, it’s a great new addition to the dining scene in Inverness, as there’s nothing else like it here! Prices too were very reasonable – including our drinks the bill came to under £50 easily, but if you weren’t drinking then you could easily have a meal for two there around £25. Service was good too – when our first drinks order was forgotten there were profuse apologies and after that the staff were very attentive. We paid for a meal, this is not a sponsored post.